On following four American exchange students to the ends of the earth in search of the best education. It is a naturally arresting image at the start of Tracy Droz Tragos’ latest film “The Smartest Kids in the World” to see a young black woman standing in the midst of a bustling metro station in South Korea, patiently waiting for the subway as others show no such restraint in pushing past when one of the trains arrive. Obviously, it’s going to take some time for Simone, a 17-year-old from the Bronx to adjust to her new environment, but in the nonfiction adaptation of Amanda Ripley’s study of global educational trends, Tragos flips the image on its ear as you come to learn South Korea with its high math and science standards may be a far better fit for Simone than In New York where she never feels challenged enough. It isn’t only the four Americans that Tragos follows who seek a challenge in “The Smartest Kids in the World,” but also of the filmmaker who ambitiously criss-crosses the globe to see where different countries put their educational priorities. Taking the vantage point of the students, rather than parents, teachers or administrators, Tragos, who previously displayed such sensitivity in capturing the perspective of her young subjects in “Rich Hill,” offers ground level revelations about the contemporary educational experience where no one country has likely figured out a perfect system to teach a diverse array of young minds, yet different approaches have yielded more success than others. 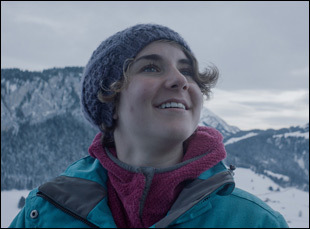 In Switzerland, the filmmaker joins Brittany, a vivacious 16-year-old from Orlando, Florida who is perplexed by having so much free time on her hands as her new school fosters critical thinking by allowing its students to follow their interests and come to class when they want to. Meanwhile, Jaxson struggles to assimilate to the Netherlands where math classes are as far beyond his comprehension as the Dutch they’re taught in, but he wasn’t exactly speaking the same language as his peers in his hometown of Saratoga, Wyoming where he knew wrestling, seen as important by his school, was unlikely to take him far after graduating. Then there’s Sadie, a career-minded ex-pat from Maine who is interested to discover that nearly two-thirds of the country attends vocational schools dedicated to specific trades rather than ones that are multidisciplinary. “The Smartest Kids in the World” intersperses interludes of Ripley drawing on her research to put the kids’ experience into a greater context, but over the course of one school year abroad, Tragos conveys thought the footage alone how different cultural attitudes towards education have shaped generations for better or worse and how this current crop of kids is more conscious than ever before of the alternatives they have available to them as far as where they go to learn. Following the film’s premiere at DOC NYC this week, Tragos spoke about making a film as intimate in perspective as previous films such as “Rich Hill” and “Abortion: Stories Women Tell” while extending her lens to an international scale and basing a documentary on a book when the filmmaking can take on a life of its own. I read Amanda’s book and I knew that there was some interest in perhaps turning it into a film, so I really jumped at the chance. I have two daughters approaching the age where they’re going to be in high school and it felt timely for me, but also I was so excited to make a film inspired by what other countries are doing and hear from students when so many education films focus on administrators and what’s broken in the U.S. system. That really appealed to me and felt like we could do something different in taking that approach. How did you find your kids? The exchange program was very supportive because they were familiar with Amanda’s book and had a relationship with her, so we reached out to them and we had a list of countries that were high-perfoming in all subjects and outranking the United States, and said, “Hey, do you have students who [are headed there]?” Through that process, we found students going to those countries who were interested in the notion of being on camera. We knew having a documentary film crew follow them periodically on their journeys was a big ask. There are a lot of people who were like, “I’m going out of the country for the first time. I don’t know what to expect. I’m not sure I want a documentary crew to be following me.” But many of the students that did want to be a part of it were so frustrated with their U.S. high schools and really their intention in going to other countries was to experience something radically different than what they experienced at home, so the students we ended up covering in the film really stood out. Logistically, this seems like a radically different undertaking than previous films. What was it like to figure out? It was daunting, but I felt I can keep doing things that are in my comfort zone or I can branch out and challenge myself. I think I succeeded in still connecting it to the stories of these students [because] what I like to do is focus on people and their experience and their stories, but to the extent that it fits into this more macro idea, that was my challenge. It really was a logistical challenge and required a team who really supported the effort. I was around for most of the shoots that I did and it is true I did try to sometimes stagger it so I would come in a day after everybody else was in, so that they’d have an extra day and get used to the time difference and build the camera equipment and then I’d leave a day before and for the most part, I tried to have one person behind the camera. But sometimes there were different camerapeople because things were happening at the same time and in different countries and thankfully I have great producers working with me who helped figure it all out. When you’re adapting a book for nonfiction, is it interesting to see the ways in which reality does correspond with the text and the ways it might not when it’s making broader points while you’re capturing these more specific experiences? Yeah, what was really great about the collaboration with Amanda was she said, “Listen Tracy, you’re going to follow these students. You’re going to these countries. They’re going to have the experience that they have and let’s capture that. Let’s listen to them. Let’s not try to shoehorn them into observations I’ve made already.” But she set me up to look out for certain things, say like “Finland is known for this” or “you’re going here, so be aware of X, Y & Z.” So the students took the lead and then we brought in Amanda to give context and credibility because even though we want the focus to be on the students and believed their observations are valid in and of themselves that we’d amplify, we needed Amanda to say, “Yeah, this is not just Brittany’s or Simone’s story,”!to put it in this bigger educational context. Was there anything that happened during the course of shooting where you had an idea of what this movie would be and it changed direction on you? We didn’t expect to be really interested in Switzerland’s professional school and vocational program. We also visited other countries that we didn’t end up including because we felt the film had as much as we could get in in 90 minutes, but there’s so much more that is there. It was hard not to include Belgium, for example, [which] has a really great educational system and really inexpensive college and it was inspiring to see when you take out the worry about paying for college, you can let high school students dig into high school and not worry about figuring out how I’m going to pay for college, which is often what the high school experience has become about. One of the craziest days of shooting appears to be the college placement test in South Korea where the country’s students only get a single shot, all on the same day. What was that like to capture? That was a day that we had three cameras and you’d think that it was the Super Bowl. It starts off super early in the morning and we knew there was a window when people are arriving to take the test, so we wanted to be at different schools. There were kids getting into costumes and mascot outfits and signs and news crews and vans and it was intense. Once the test starts, it’s so quiet and all the parents are outside praying or they just sit there all day long. It’s an incredible amount of pressure that these students are under to take this test, but at the same time, there was something inspiring about seeing how many people cared so deeply and rallied around it and were cheering [the students] on. What’s it like to get to the finish line with this? Getting to the finish line was not without pain and suffering, but no pain no gain, as they say. This was a tricky film, but it was exciting to share it with our first audience just yesterday [at DOC NYC]. It was amazing to have all the students together and to have Amanda there and the audience laughed at all the places I hoped they might laughed, so I’m really happy with where we ended up and I’m hopeful more people will get a chance to see it. “The Smartest Kids in the World” does not yet have U.S. distribution. Interview: Hannah Fidell on How a Funny Thing Happened on the Way to "The Long Dumb Road"
Interview: Nijla Mu'min on Growing Into a Filmmaking Identity with "Jinn"